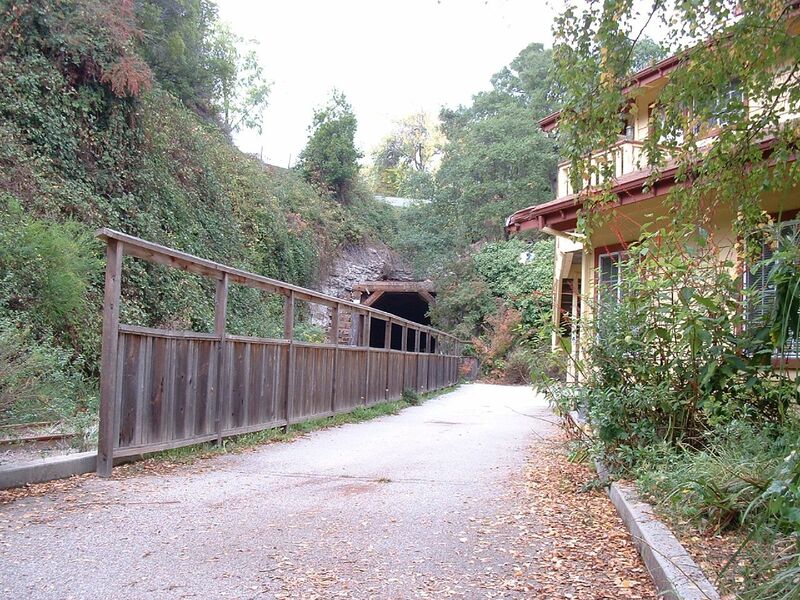 At the intersection of Green and Chestnut Streets on the south side of the Mission Tunnel (SPC #8) is the location of the Park Street Flag-Stop, the last flag on the Mountain Route before reaching Santa Cruz Depot which was about 1/4 mile further south down the tracks. Much like the area on the north side of Mission Tunnel, little remains of this flag-stop. Even the street that it is named after disappeared when Chestnut Street was rerouted and Mission Street (Highway 1) was expanded in the 1950s. Prior to its use as a flag-stop, the location was the original South Pacific Coast station and freight yard for Santa Cruz, but that was moved in the 1880s and this site became just another stop. Still, the location of the street still survives as does a single signal-light cement block signal stand near the exit of the tunnel. Park Street was located between Cherry Street and Union Streets. 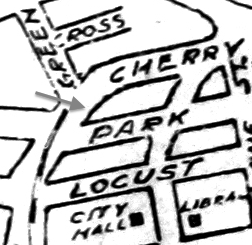 Cherry St was later renamed Chestnut Street after the rerouting. It survives as an alleyway and parking lot until it reaches Squid Row, another perpendicular alley that parallels Center and Chestnut Streets. In the Google StreetView below, Park Street appears as the driveway/alley to the right of the lime green car. The tracks meet the street at roughly this spot after heading out from the tunnel, which is at left. Based on the location of the flag light, the cement base of which still survives about five yards from where the tracks merge with the street, it is probable that the train exited the tunnel and then stopped to pick up people at Park Street. My hunch is that this stop was primarily used by people heading toward Los Gatos who wanted to bypass the mess of tourists at Santa Cruz Depot. The train must have stopped in the middle of Cherry and Chestnut Streets to pick up passengers since there was not much space coming out of the tunnel for passengers to board. There is a fairly long stretch of clearing on the east side exit of the tunnel near Park Street and what used to be Cherry Street. Today it is a driveway (below) but it may have once had a platform of some type. The flag-stop does not merit a mention in the 1899 Station Book nor any notice on the various timetables. It was located roughly 80 mile south of San Francisco. Nothing else is currently known or written about this obscure flag stop. Just to set the record straight... This was not a "flag stop" This is the location of the original Santa Cruz depot. It was a covered, train shed type building that stood exactly where the building in your last photo stands. 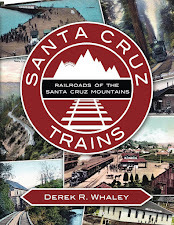 There are lots of images of this area in Bruce McGreggor's book "South Pacific Coast," and also online if you do a google search for "SPC Santa Cruz Station" The station at this location was built before 1885, so when your "1889 Station Book" refers to "Santa Cruz," This is the location they are talking about. The Concrete base that you mention is for a Southern Pacific (post 1900's era block signal. These exist all up and down the line from Felton to Santa Cruz, but were certainly not around during SPC ownership of the line. Before Park Street and those condominiums existed, this whole block between Cherry and Locust St. was the location of the SPC yards and enginehouse, prior to the construction of the yards and SP shops at the end of Chestnut St, South of Laurel St.
Nathan, welcome to my blog. 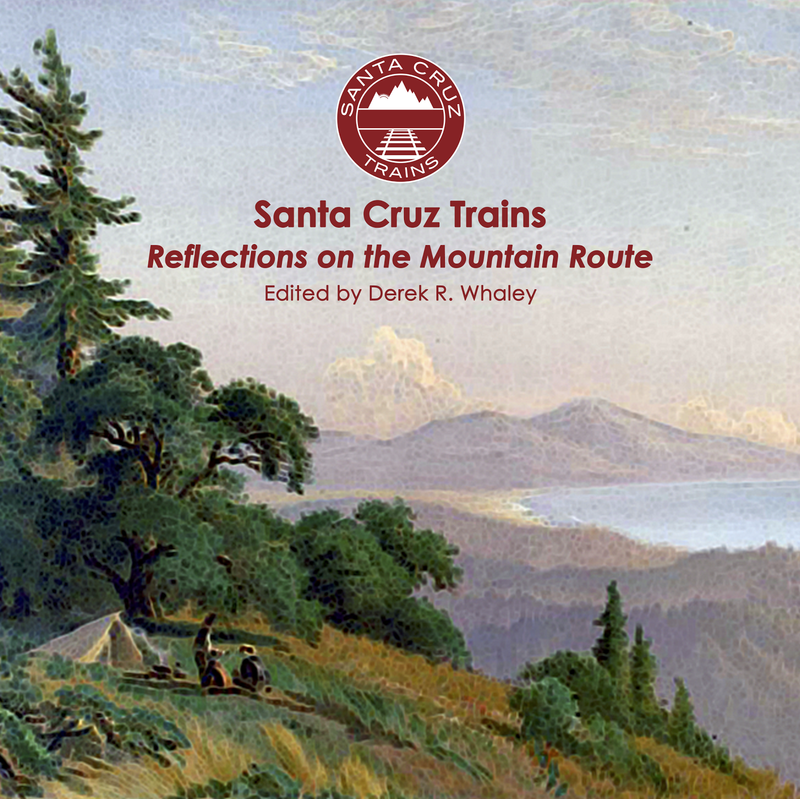 I have researched the topic thoroughly and I am not discussing the South Pacific Coast Santa Cruz Station in this post but rather the Southern Pacific Sunset Route's flag-stop that was located here after the South Pacific Coast was taken over by Southern Pacific. The station book does not mention Park St. at all. If you read ahead to my next post, you can read a bit about the current station site as well as some photographs of it from the late 1890s onward. I have read through McGregor and Hamman's books and understand the layout quite well. In fact, I wanted to post the layout scheme of the station but don't have the books with me currently to copy the image from. I apologize that I did not include information on the earlier SPC yards located in the area, but the information was not available from the resources I currently have at my disposal. I plan to expand these posts in the future with further information. However, a Google search for "SPC Santa Cruz Station" turns up absolutely nothing regarding either. One last point, I do not once imply that the cement block was built in the 1880s in this post. The SPC was a subsidiary company of Southern Pacific Railroad until 1936 when it was wholly bought out. This blog reflects its entire history and the history of the route, not necessarily just the period when it was independently owned and operated.